(CNN) -- A man angry that a family was talking during a movie threw popcorn at the son and then shot the father in the arm, according to police in Philadelphia, Pennsylvania. James Joseph Cialella was charged with attempted murder, aggravated assault and weapons charges. James Joseph Cialella, 29, was charged with attempted murder, aggravated assault and weapons violations, a police report said. Cialella told the family sitting in front of him in the theater on Christmas Day to be quiet, police said. An argument ensued while others at the Riverview Movie Theatre watched "The Curious Case of Benjamin Button," starring Brad Pitt and Cate Blanchett, The Philadelphia Inquirer reported. Cialella then approached the family from the left side of the aisle and shot the father, who was not identified, as he was standing between Cialella and his family, according to the police report. The victim was taken to Jefferson Hospital with a gunshot wound to his left arm, police said. 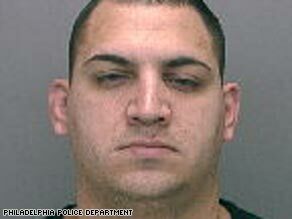 Cialella was carrying a Kel-Tec .380-caliber handgun clipped inside his sweatpants, police said. He was arrested and taken into custody.